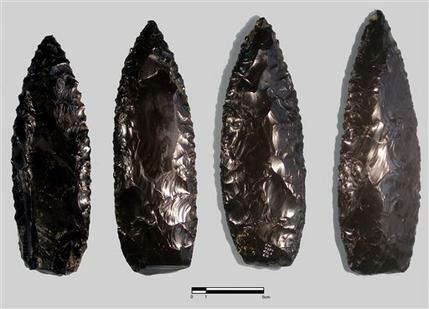 Traces of blood and fragments of muscle, tendon, skin and hair found on 2,000-year-old stone knives have given researchers the first conclusive evidence that the obsidian blades were used for human sacrifice so long ago in Mexico. Researchers had long seen cut marks on ancient bones that appeared to suggest varied practices of dismembering victims in many pre-Hispanic cultures, but the find announced Wednesday positively identifies the sort of actual knives that were used in the ancient rituals. Researchers in Mexico had noticed what they believed were fossilized blood stains on stone knives as long as 20 years ago. But the institute said it took a methodical examination using a scanning electron microscope to positively identify the human tissues on 31 knives from the Cantona site in the central Mexico state of Puebla. The collection of stone knives is from the little-known Cantona culture, which flourished at about the same time as the mysterious city-state of Teotihuacan. Cantona preceded by more than 1,000 years the region's most famous human sacrifice practitioners, the Aztecs. The archaeologists who found the knives gave them to researcher Luisa Mainou at the anthropology institute's restoration laboratories about two years ago. With help from specialists at Mexico's National Autonomous University, they were studied under the scanning electronic microscope and found to contain red blood cells, collagen, tendon and muscle fiber fragments. While historical accounts from Aztec times, as well as drawings and paintings from earlier cultures, had long suggested that priests used knives and other instruments for non-life-threatening bloodletting rituals, the presence of the muscle and tendon traces indicates the cuts were deep and intended to sever portions of the victim's body. "These finds confirm that the knives were used for sacrifices," Mainou said. Susan Gillespie, associate professor of anthropology at the University of Florida who was not involved in the research project, said it was the first time to her knowledge that such tissue remains had been identified on obsidian knives. "This is a compelling demonstration that these knives were used to cut human flesh," Gillespie said in an email. She said other studies have found trace elements of organic remains such as food on ancient artifacts, so "with the right conditions such remains can preserve for long periods." Gillespie said human sacrifice practices described by the Spanish conquerors or depicted in pre-Conquest paintings include heart removal, decapitation, dismemberment, disemboweling and skinning of victims. The find announced Wednesday has already begun to shed some new light on the sacrifice practices of pre-Hispanic cultures, which believed that human blood was a sort of vital liquid needed to keep the cosmos in balance. Some knives in the test had more traces of red blood cells, while others had more skin, and others more muscle or collagen, "which suggest that each cutting tool was used for a different purpose, according to its form," Mainou said. Gillespie said the find also suggested the possibility that the sacrificial knives were ritually deposited, unwashed, in some special site after being used. The Spanish conquerors have long been suspected of exaggerating accounts of mass human sacrifice in pre-Hispanic cultures to make their Indian subjects appear more brutal and less deserving of sympathy. "The archaeological confirmation of human sacrifice is important both for supporting or contesting the many post-conquest historical accounts and pre-conquest imagery of sacrifice," Gillespie wrote. Ventura Perez, an assistant professor of biological archaeology at the University of Massachusetts Amherst who specializes in researching ancient forms of social violence, says bodies were sometimes hacked to pieces in the pre-Hispanic world for different reasons. His analysis of cut marks on bones suggest that some may have been allowed to rot and were later dismembered for reburial, or that specific parts of bodies like craniums and long bones may have been harvested from bodies to keep as a form of ancestor worship. He noted, however, that the presence of blood on blades suggested the victims bodies' were fairly fresh when cut.